As I'm writing this, Daytripper is getting its 5th reprint, and will be appearing in French as well. It has numerous accolades: winner of an Eisner for Best Limited Series in 2011, New York Times Bestseller, one of the bestselling comics of 2011 on Amazon, plenty of favourable reviews. The storytelling technique is wonderful. Art is great. Colouring by Dave Stewart is exceptional. 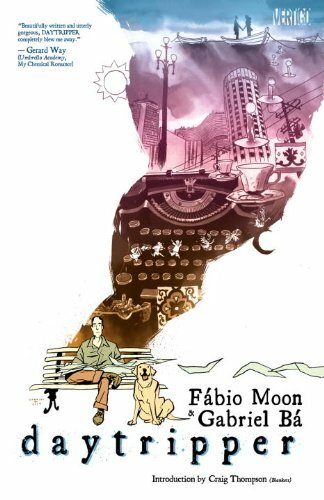 Daytripper is a story by Brazillian twins Fábio Moon and Gabriel Bá. It's a story about Bras de Oliva Dominogos. He's a writer who writes obituaries and dreams about making it big as a successful author like his father. Every chapter in the book is a snapshot at Bras' life at various stages. It's an interesting storytelling device. It jumps back to and fro, giving us a glimpse of his life. It all feels very real until each chapter ends with a twist. "Like all great stories, each day has a twist he'll never see coming...", so says the book. The twist is he dies. That is not a spoiler by the way. It ceased to be a twist from the second chapter onwards. Used once or twice is quite cool. When every chapter ends with the same twist, there must be a point to them. The thing is, Daytripper's story can't be told without those twists. Daytripper is a unique event driven story, and that's the strength of the story. However, I felt like it needed more to be a great story. It sort of like the movie Groundhog Day except character development is missing — every chapter is a new Bras. It lacks some sort of closure to tie all the stories together, to make the story better, and have readers feel more about the main character. Good book! Personally I felt just as the tag on the book says, "what are the most important days of your life", the whole book is about, what if, what if you died at this age when you were doing what you remembered most. It made me think about my life, and how I many times I have "reset" my life, moving from different stages of life, leaving behind old lives as though they never existed anymore, yet remembering them as though from another life, just never continued.